We are very pleased with the system and the recent service provided by Stehpen. He took his time to check all the fittings and showed us how effective the filters work as a system to provide us with clean drinking water. Service was excellent! Highly recommend! Just had my Pure Water System serviced by Stephen. Had it since 2013 and it makes world of difference in purifying our well water. Love it. Stephen was a great service pro. took care of everything. He even emptied under the sink and then put everything meticulously back...fixed the loose faucet perfectly and adjusted it all. Delightful person and so well groomed and courteous. He can come back anytime! Thank you Stephen and Pure Water! Stephen did a fantastic job! Very pleasant personality as well. Thank you! I have used Pure Water service to maintain my water softer for over 15 years. Great group of honest hard working staff. I would highly recommend this company to anyone looking to buy and install a full house system. I love it! Jim came out yesterday and installed my Rain soft system from our previous house to my new house. He was on time and does an great job of making sure the install looks clean and professional. The sheetrock was patched around the pipes and tubing secured along the bottom edges of the garage. We also did a good job cleaning up the mess. Not going to write too much except to say the people who work at Pure Water know their business, are kind and helpful. Jim serviced our system and was very accommodating as I had lots of questions to ask since we are fairly new in our home and this environment. He even gave me advice on what I should do when planting a veggie garden as I have been having problems growing things because, as I found out from him, of the acid in the soil here. So, thank you, Jim and folks at Pure Water. Jim is a great service technician. He is really helpful and willing to take the time to answer all of my questions. Kristina and Tara are both very personable and helpful. Excellent service. Above and beyond what you would expect. I had Culligan service before Pure Water. I had Pure Water install a two stage water softener and neutralizer tank (I have acidic well water). The unit paid for itself in about 1 1/2 years so I'm saving money now. I have Mike do the annual maintenance on the system. He's a really nice guy and knows his stuff. Also the folks in the office are very helpful in setting up appointments. I've had some experiences with water softeners making the water taste funny. No such case with my Pure Water installation. In fact, the water is so good that I refill plastic water bottles to take around when I need them. It tastes close to spring water now. I also had a big problem with calcium in my water leaving water spots. My system improved that situation. We just bought a house out in the country that has Hague Water systems installed (water softener and R.O. under the sink system). The house was vacant for almost year and clearly needed service on the systems so I called the number on the machine hoping the company was still in business. When I called, Tera was very sweet and handled my call with care and was able to verify the last time they were serviced. On the day of my appt., Jim arrived and immediately recognized the systems as he installed them several years ago! He was very courteous and knowledgable as he has been doing this for many years and that made me feel so much better :) He was able to fix everything and get our systems up and running in no time! I am very satisfied with this company and would highly recommend them for their service! A for Jim! Jim is the best!! I look forward to seeing him each year for annual maintenance. Jim came out yesterday and did the yearly service on our water system and I couldn't be happier. My husband and I moved into our new home (to us) a little over a month ago and did not know a thing on how it works. Jim was very friendly (AWESOME personality) and took the time to explain everything to us. We couldn't be more grateful for his time. He was thorough and cleaned up after himself. The tips he left us with were valuable. Jim knew his stuff and was very familiar with our property and system which was comforting to know, it was if he was visiting an old friend. just installed a water filter system in our fourth home. great people and service. great tasting water from reverse osmosis system. we do NOT buy bottled water! we had an underground water leak on a Saturday of Easter Weekend, Jim was here in approx one hour to fix it! no shower calcium build up, soft clothes, i do NOT use fabric softner! First time I used this company. Jim Showed up and had all the answers. Fixed my immediate problem & setup the fix for the larger issue. "I have used Pure Water, Inc to service my water softener and reverse osmosis filter system for a couple of years now. Jim C. Is the specialist that handles the on site service calls. Jim is both knowledgeable and professional. When I had a ground water contamination issue last year, Jim was able to explain the probable cause and take the necessary steps to return my system to serviceability. In addition, I have worked two technical issues, one via Kristina and one via Tara. Both were resolved quickly without a service call and are a testimonial to the strong coordination of this organization. I am extremely satisfied with the service provided by Pure Water Inc. and would not consider using another vendor based on my experience to date. 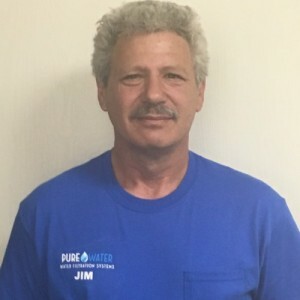 Richard Vaughan"
Very happy with the service of Pure Water Inc. especially Jim! As usual Jim was on time, very professional and efficient. In and out within about an hour. Jim's work was outstanding! His maintenance service of our system was thorough and professionally done. In addition, he was very personable and took the time to explain the entire process. Thanks for a job well done, Jim!! Jim and Pure Water Inc. have been servicing my Hague softener and R.O. system for the past 4 years and I have always been happy with the service. As a water professional myself, its great to have knowledgeable people performing the annual service on our well water system. Thanks again!